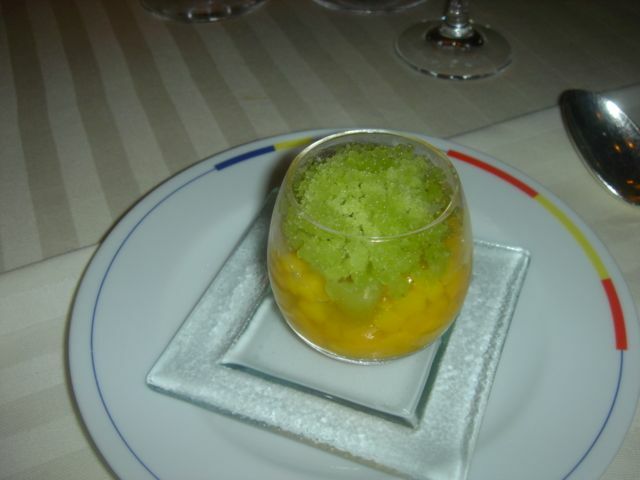 Our original plan was to go to Les Ambassadeurs at the Hotel Crillon, but recent reviews from fellow Niac members painted a less than perfect dining adventure plus the fact that many years ago we had an absolutely awful evening there. Many of the top choices were closed for “Spring Break” so our choices were very limited. Guy Savoy was the best alternative. As you will see, it was an excellent choice. 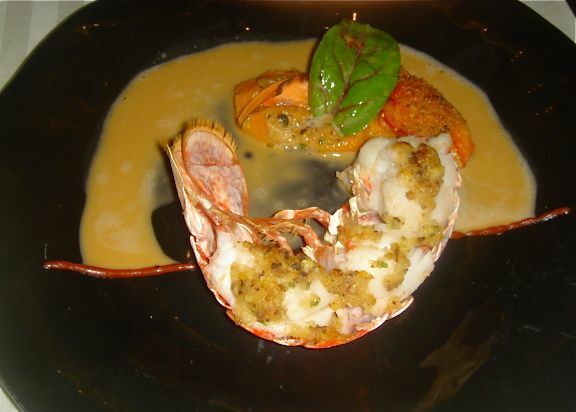 We chose the large tasting menu called “Coleurs, Textures et Saveurs”. 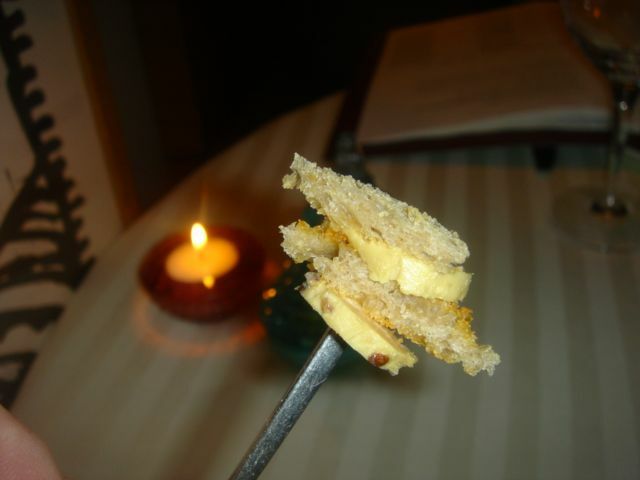 Foie gras on toast presented on a skewer—2 skewers per person. 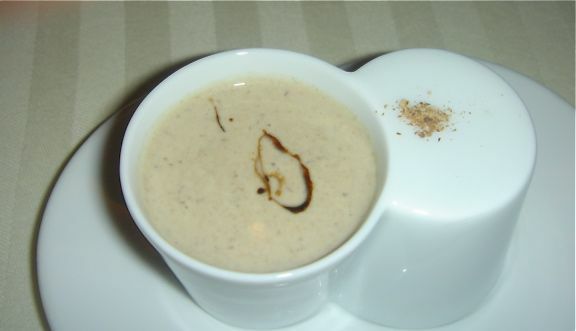 Amuse # 2: Cream of mushroom soup with mushroom powder [to be swept into the soup]. The presentation was the first of several very unique, custom pieces of china. 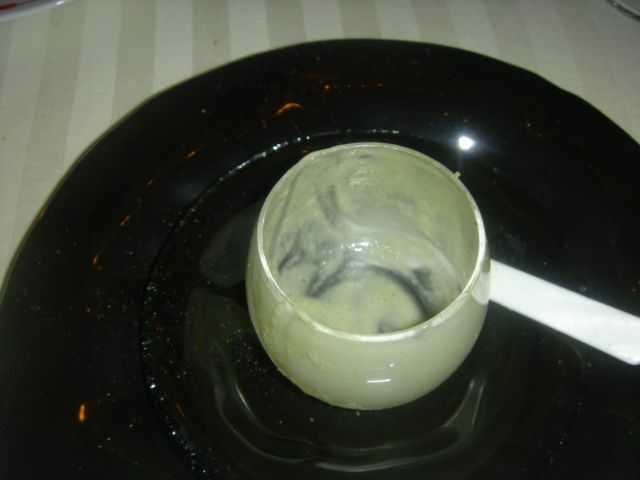 For the soup it looked like side-by-side cups with one upside down [right with the mushroom powder on it] and on the left a little demitasse cup—picture two cups looking like Siamese twins. 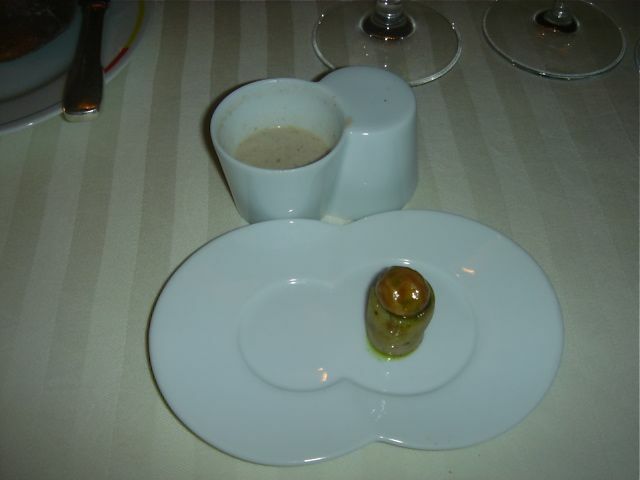 Once we had the wonderful soup we were told to turn the “twins” over and there was a small ratte potato filled with mushrooms—a real treat. Drama is the name of the game at Guy Savoy. The meal is not just about the food. He loves the unexpected, the theater of cuisine. Many of the plates are specially designed for a particular dish. This is the height of top level dining, not just food, room, service but even china for the best of the best. With the food tasting we were offered a “bread tasting”. The “bread lady” an attractive young French girl armed with a large cart with many different breads and a special bread carving knife offered to pair our breads with each dish. She indicated that each bread was designed to go with a particular dish. The last time we dined at Guy Savoy we found the “bread guy” very annoying stopping at the table, interrupting our meal, and generally being a pain. This was a nice way to enjoy the breads and not have anything but a cute girl presenting the bread just before or after the dish was served. The bread matches were excellent and more special “entertainment” from Guy Savoy. 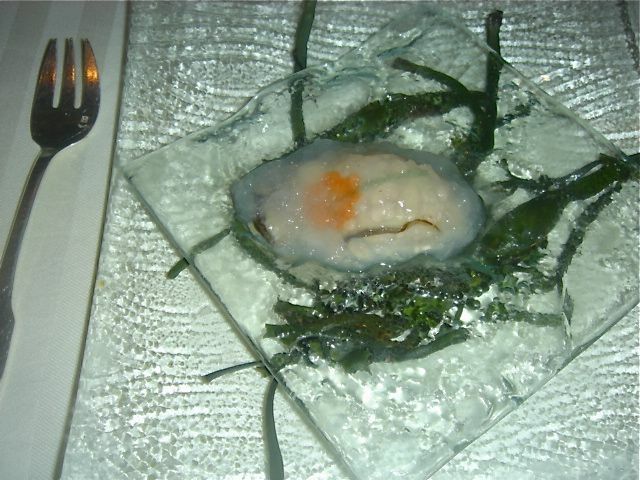 First course: the famous oyster dish—“clear iced poached oyster” sitting on a glass plate under it a glass plate strewn with fresh seaweed. This was more drama and delicious. Seaweed bread was the bread offered and a perfect pairing with the oyster. 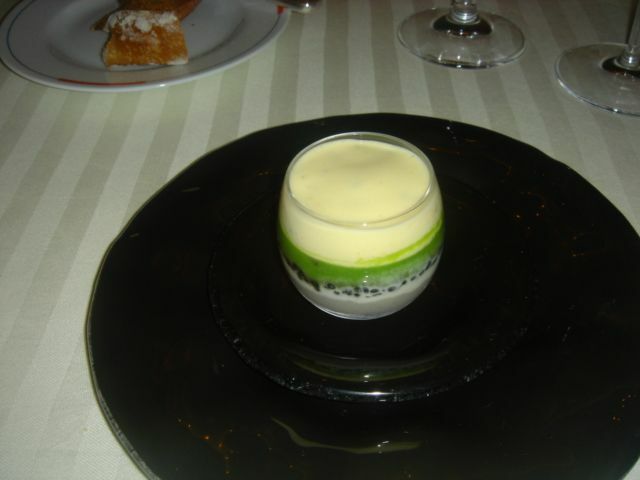 2nd course: Colours of Caviar—we did not know what to expect—picture a small round glass layered with green bean puree, caviar, caviar cream, sabayon—the look was layers of white, green, black, white. The amazing thing was that the caviar portion was so generous and delicious with pearls of caviar in every bite. The bread—spelt. 3rd course: Turbot. The turbot was presented whole roasted on the bone. It was then returned to the kitchen and plated on a dish with a liner dish with tiny holes in it. 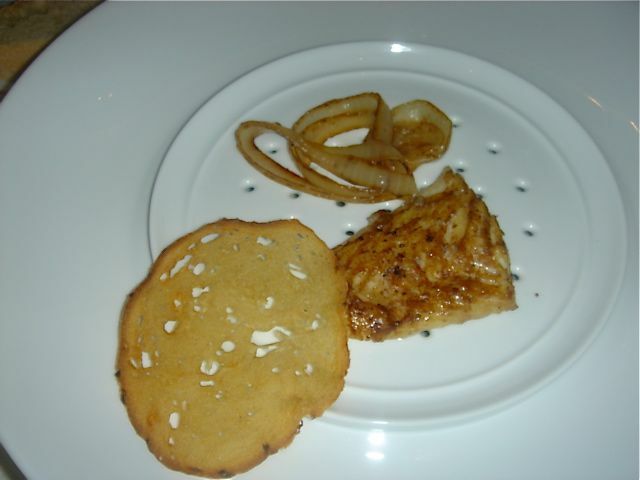 According to my lousy notes there is mention of smoked seaweed, onions a la plancha and turbot butter. It was superb. The plate with the holes. 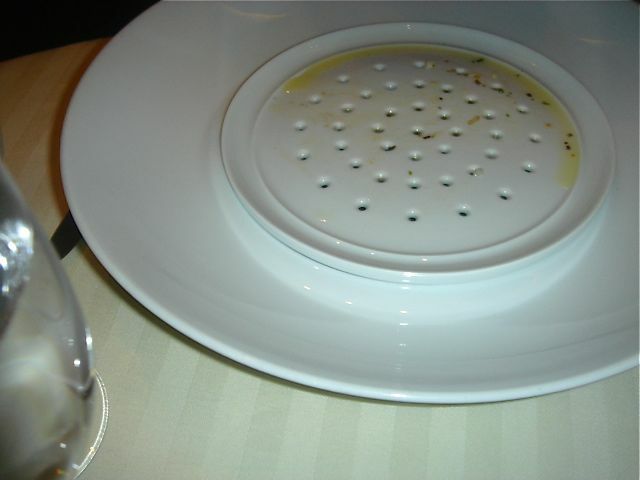 Once the fish is consumed the plate with the holes is removed. 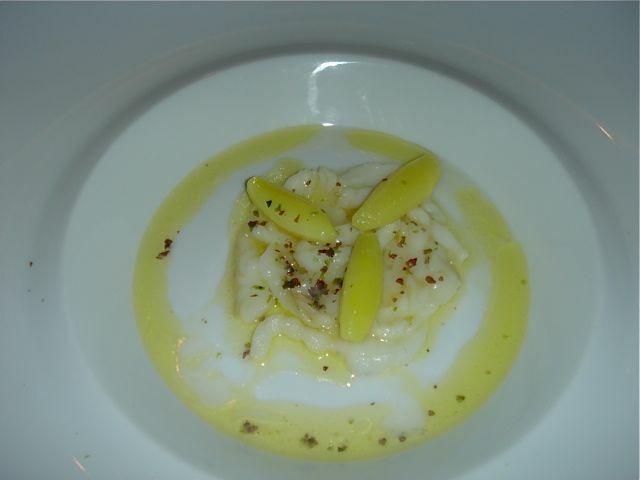 Underneath turbot carpaccio with potatoes and olive oil. Again, Guy Savoy drama—with no flavor sacrifice! Bravo! Bread—ciabatta bread. 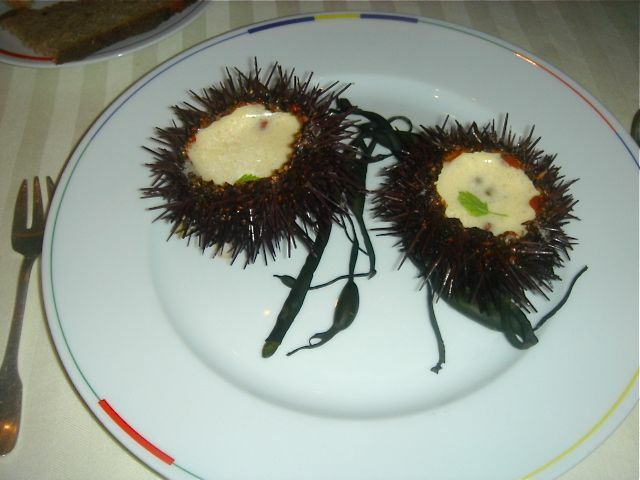 4th course: Hot sea urchins served in the shell with Chinese artichokes and uni butter. We are so familiar with Santa Barbara Uni that this Uni from Brittany was quite a surprise—instead of a rich gold/yellow color these were almost dark red/maroon. The uni clung to the shell. It was really important to scrape every bite of uni into the uni butter sauce. The Chinese artichoke added a wonderful texture. Bread—rye. 5th course: Breton grilled lobster with carrot puree and strips of carrots + lobster coral, white wine stock—absolutely superb. 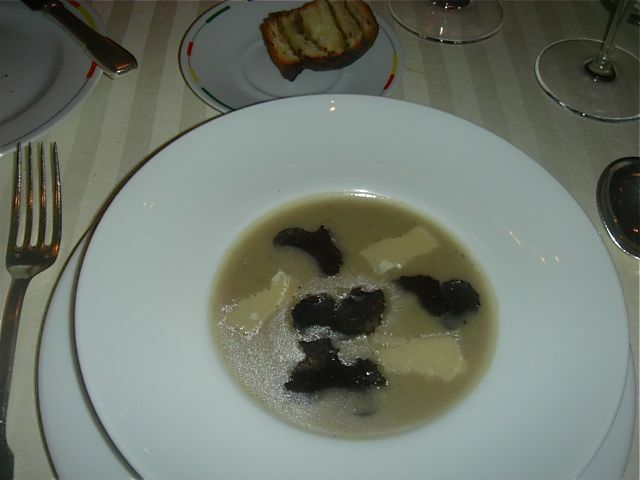 6th course: Signature dish—artichoke soup with black truffles, brioche feuilletee with mushrooms and truffle butter. This was our first time having this dish. We were not impressed. It was heavy and clumsy…not sure what it is supposed to be but this night, dull and clumsy. Bread—5 seed bread. 7th course: Roasted foie gras with a nage of red savoy cabbage, horseradish and mustard. This just did not work—a muddle of flavors and the foie was not cleaned well. 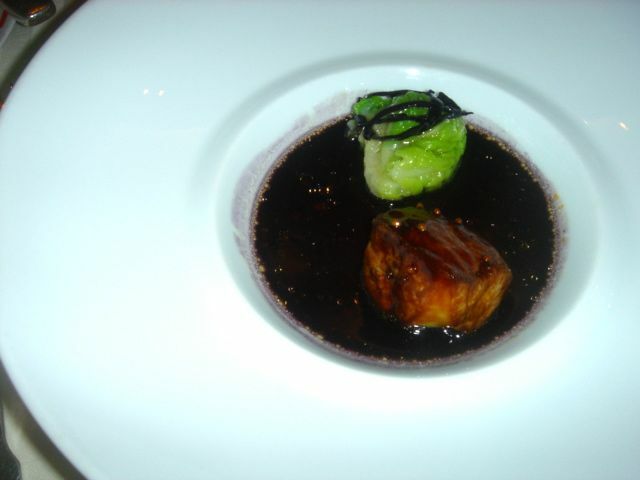 In comparison, Arpege’s foie two days later left the Guy Savoy presentation in the dust. Bread=chestnut. 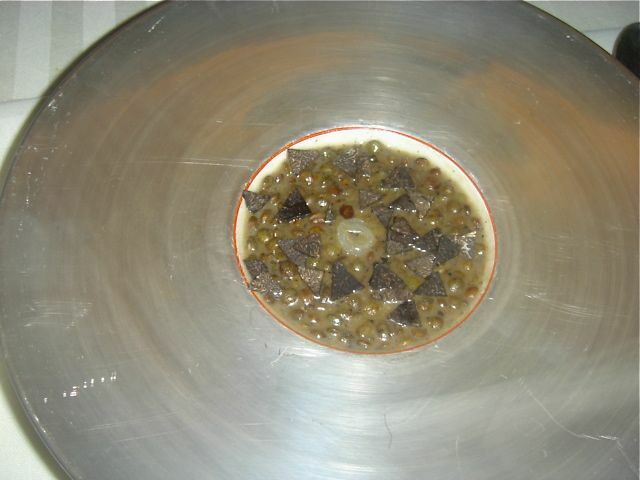 8th course: Another signature dish—this time it worked—ragout of lentils with black truffles. This course was presented in two portions for each of us. The first portion. 10th course: Exotic dessert—over the top by this point too much food. The wine was excellent and a good choice with the early dishes. 2000 Saint Joseph Les Serines Eves Culleron—a perfect choice, big, fruity, great finish well matched to the foie, lentils and cheese! Guy Savoy has not been in our top favorites in the past, but it was definitely a perfect way to start the trip. 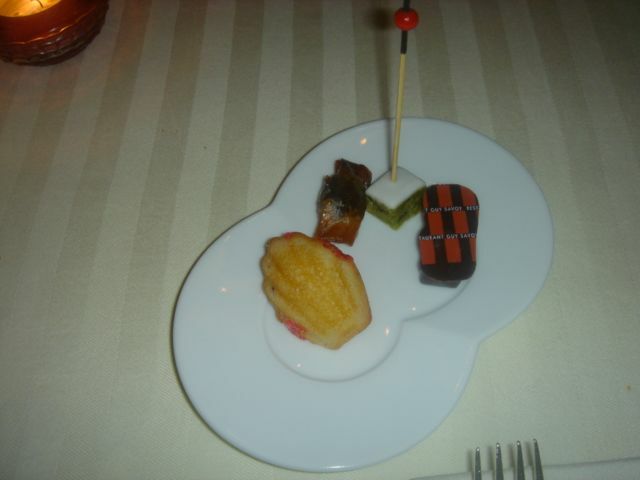 The innovative dishes and unique serving pieces made the meal very dramatic. The flavors were special. One of the major reasons for dining in Michelin Three Star Restaurants is to be blown away by the chef. The caviar dish, the turbot, the Breton lobster with carrot puree and the lentil dish were all things we haven’t had before, done extremely well. Yes, two dishes let us down. But the over-all experience was one of innovation, highest quality, new and different flavors. To us this is the “value” in 3 star dining. The service was excellent. Dishes were explained and food was presented with enthusiasm and pride. From the “bread lady” to the sommelier the whole team is truly professional. We spent from 7:45-11:45, a long meal, but well worth it.